The smell of Grammy's house and her famous chicken pot pie is an unforgettable comfort. Our family loves dogs and we thought it was about time to share this great taste with yours. These tender chunks of chicken are sure to make your dog beg to go to Grammy's, even if they have to eat their vegetables. Merrick Grammy's Pot Pie™ dog food is prepared with chicken, potatoes, carrots, peas and apples. 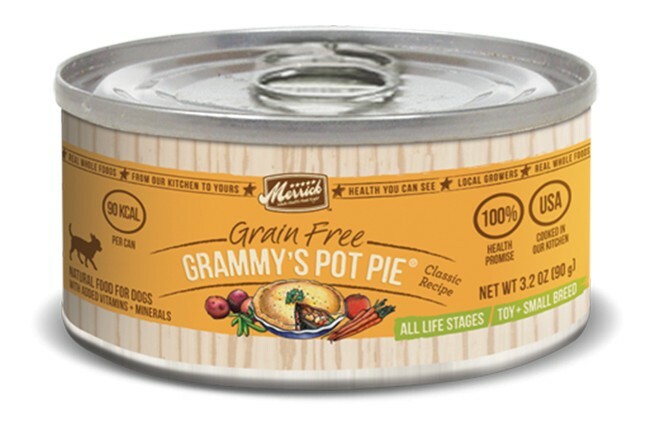 Merrick Classic Grain Free Small Breed Grammy's Pot Pie™ Canned Dog Food contains no artificial colors, flavors or preservatives. It contains delicious home-style chunks that your dog will love.